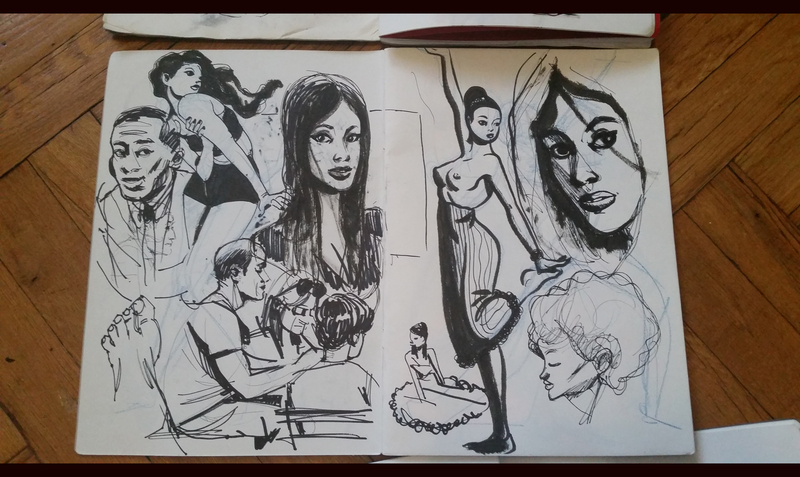 When I was in art school, I was obsessed with people’s sketchbooks. More specifically, the sketchbooks of artists whose work I was a fan of. There were a number of these artists who would regularly post pages from their sketchbooks on their blogs and websites and I would gawk and drool over every line, brush stroke, and coffee stain wash. This allowed me glimpses and insights into the minds of artists that I admired. It gave me a look at their thinking, their experiments, their work ethic, it was all super inspiring. As a young art student, I too wanted to be able to spew out pages and pages of inspired, free form work that I could keep neatly bound within a beautiful hardcover book and take with me everywhere I went. So I headed to the art store and bought the most precious book of blank pages I could find. It was hand bound, hardcover and had cotton rag pages that felt like a cross between paper and canvas. I paid the expensive price for it, put it in my bag and took it home. I was so psyched to finally have a place where I could let loose and make the kind of free form, uninhibited work that I was such a fan of. Now all I had to do was draw in it. That was harder than I thought it was going to be. It was like there was some sort of force field between my pen and the page, preventing me from making a decent mark. From the start, I spent more time thinking about what I should draw in it than actually drawing in it. I mean, the pages were so soft and pretty and the whole thing was so expensive, one ‘wrong’ drawing could mess the whole book up! So, I stuck to what I knew; I drew a lot of figures because that was one of my strengths and I filled up a lot of pages with overly detailed line work that looked really cool as far as page design goes, but didn’t really have much structure or substance underneath. 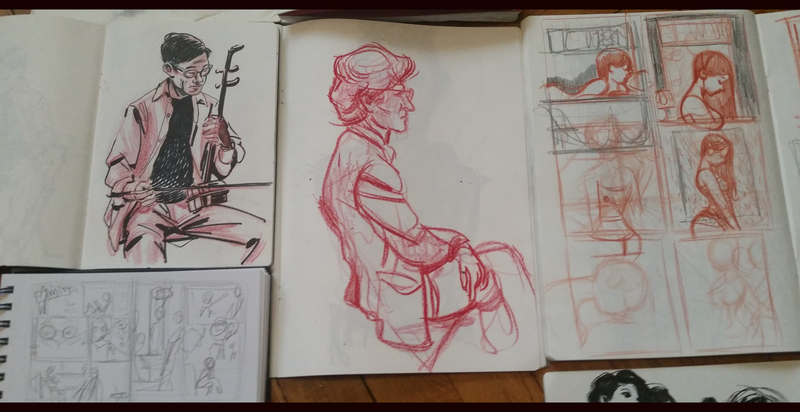 I kept a separate sketchbook just for model drawing because those quick gestural poses didn’t really fit the ‘theme’ I had going on in my sketchbook. I wouldn’t include any thumbnail drawings of comic and illustration ideas because that would clutter it up and make it look ugly. After several unsatisfying sketchbooks, I started to realize I was treating them more like portfolios than actual sketchbooks. This was a turning point for me. It’s not like I didn’t have sketchbooks in the past. I had tons of sketchbooks all throughout my childhood and teen years. They were the kinds you’d find at pharmacies or the cheap generic ones at the art store. They were ugly and clunky most of the time, but I had some real creative breakthroughs in those sketchbooks when I was a kid. 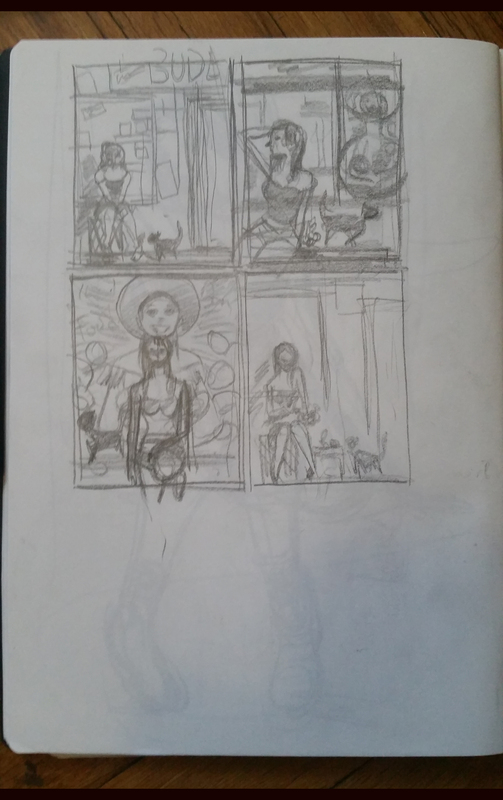 I would draw on the front and backs of pages, I would use pencil, ink, colored pencils, whatever I had around that would help facilitate my idea. Although I treasured them, they were far from precious. If you happen to be struggling with ‘sketchbook anxiety’, hopefully this helps a bit. Like just about everything in life, it’s just a mind state change. 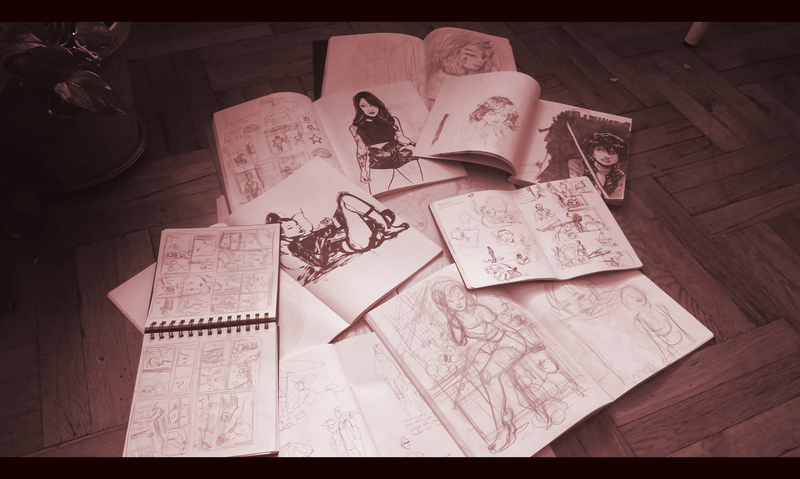 Oh, and take a look below at some (bad quality, sorry) photos from some of my sketchbooks over the last few years. Thanks so much for reading and talk to you soon! Previous Previous post: Pineapple Pattern Print! Next Next post: SuicideGirls Screenprint!